Heat oven to 350°F. Spray 13x9-inch (3-quart) glass baking dish with cooking spray. In 12-inch nonstick skillet, cook beef and onion over medium-high heat 5 to 7 minutes, stirring occasionally, until beef is brown. Stir in spinach; cook, stirring frequently, until thawed. Stir in green chiles, cumin, garlic-pepper blend, sour cream and 1 cup of the cheese. Spread about 1 teaspoon enchilada sauce on each tortilla. Top each with about 1/2 cup beef mixture. Roll up tortillas; place seam sides down in baking dish. In small bowl, mix remaining enchilada sauce and the salsa; spoon over enchiladas. Sprinkle with remaining 1 cup cheese. Spray sheet of foil with cooking spray; cover baking dish with foil. Bake 40 to 45 minutes or until thoroughly heated. 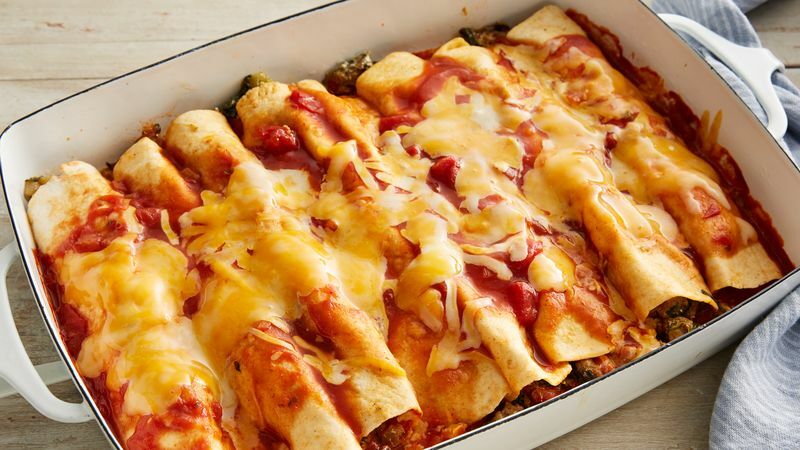 Serve these easy enchiladas with colorful toppings, such as chopped tomato, shredded lettuce, chopped green onions and sliced ripe olives. Don’t care for spinach? Go ahead and use 1 cup of frozen corn or drained and rinsed canned pinto beans instead.